"The economy, stupid" was one of the three key messages that Clinton strategist Bill Carville placed on a sign in Clinton's campaign HQ during the 1992 US Presidential election. The variant of the phrase, with the added "It's", became the unofficial motto of the campaign, and has been much quoted ever since. And, in the US context, although Republican and Libertarian candidates have often adopted the slogan as one of their own, the message is often used as a rebuke by liberals and progressives against Republican (or, generally, right-wing) economic policies, of the sort implemented by George W. Bush. This same Conservative Party has assiduously maintained that its government is the optimal choice when it comes to the Canadian economy. 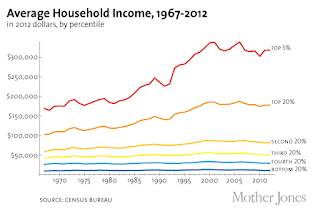 However, aggregate economic data show that this is not the case. There are two lines of attack against the Conservatives' economic record that I would like to bring up: first, the release of a recent report by economists working for Unifor, which claims to show the "Harper Government"'s  numbers in context of Canada's economic performance since the Second World War; and second, the government's inaction in the face of predictable market volatility. Perhaps other lines of attack (and defence) exist, but this is a blog, not a comprehensive analysis. In 2013, some of Canada's main unions merged to form Unifor. 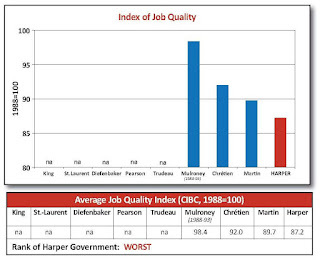 Recently, this organisation's research department published a report which sought to place the economic performance of the Conservative government under Prime Minster Stephen Harper in the wider context of the economic performance of other governments over the past 60 years, starting with the postwar government of Mackenzie King. Before proceeding with discussing the report, there are two caveats I should like to bring up. The first, of course, is that the organisation that produced the report is necessarily going to be strongly biased against the Conservative government. This may or may not present a problem with respect to its attempt at objectivity. The second is that, whether due to bias or error, the report may contain some inaccuracies. As of this writing a Google search did not turn up any criticisms of the Unifor report (whether friendly ones to strengthen its conclusions, or rebuttals), but those may be just a matter of time in coming. In fairness, I am sure the economists who actually produced the report did their utmost to avoid bias or error; all the same it may have crept in due to the cognitive limits of the human mind. 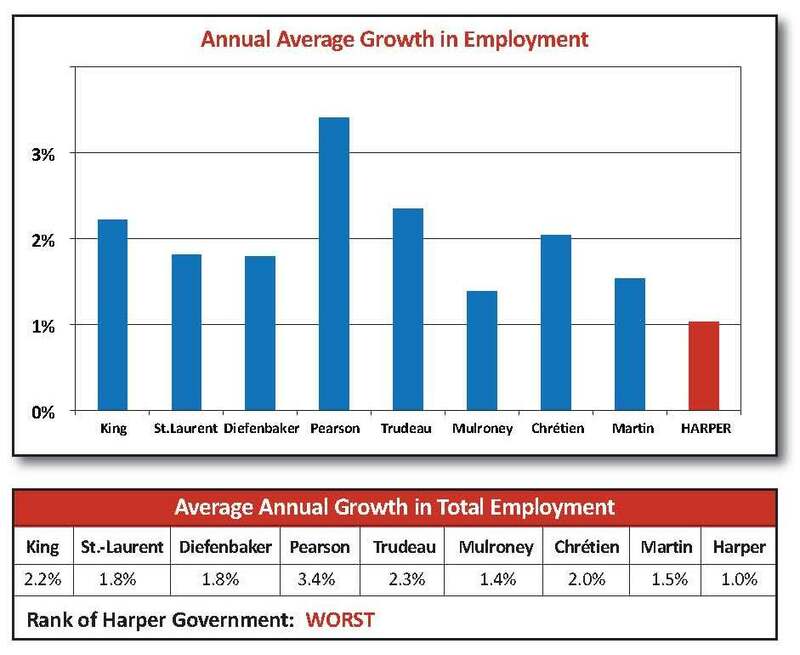 Unifor's report compares the economic record of nine postwar Canadian Prime Ministers (excluding those with a sufficiently short tenure ), with a particular interest in seeing how the government of Stephen Harper stands in the analysis. The report came up with 16 metrics which the authors felt were comprehensive enough to satisfactorily rate the PMs, in the overall categories of employment, of economic production, and of income and debt. What the report finds isn't flattering. 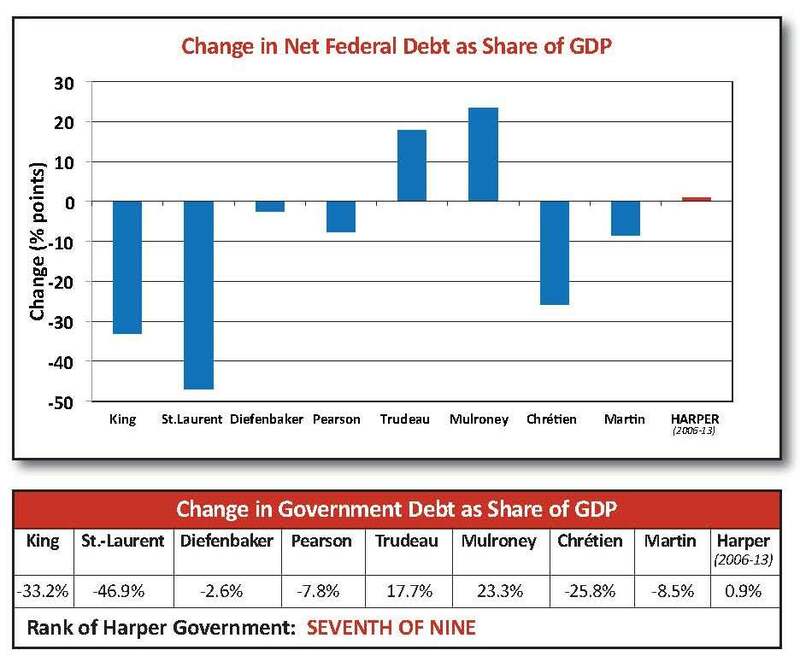 Harper's Conservative government comes out in last place, whether singly or tied, in seven categories; in six additional categories it comes in at next-to-last place. In no category does it ever rank higher than 6th out of 9 - and it manages this achievement (getting in at the bottom of the middle third of rankings) only twice. Look at all the jobs the "Economic Action Plans"  genera... oops. 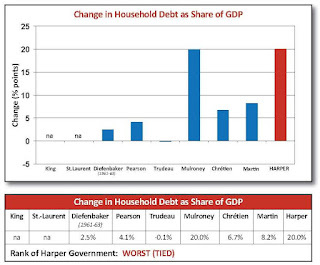 Stagnant wages and skyrocketing real estate values (of which more later) see household debt during the Harper government reach similar heights as were seen in the Mulroney era. Says it all, really. 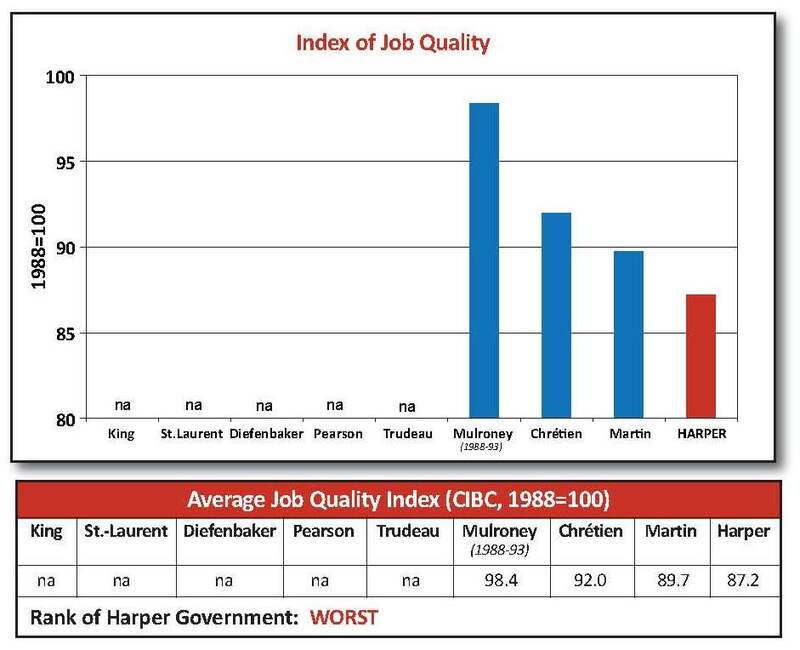 Harper's government manages the stunning achievement of outperforming Trudeau and Mulroney. Time to crack out the champagne, am I right? 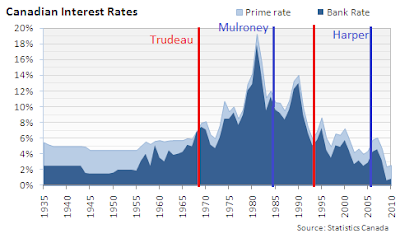 But there is a crucial factor which makes the situation worse for the "Harper Government": interest rates. 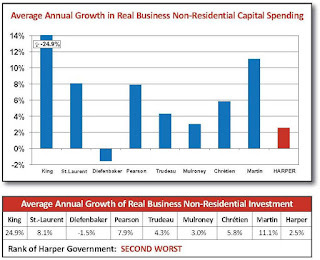 In the graph below, I have marked up the start years of the Trudeau, Mulroney, Chrétien/Martin, and Harper governments. 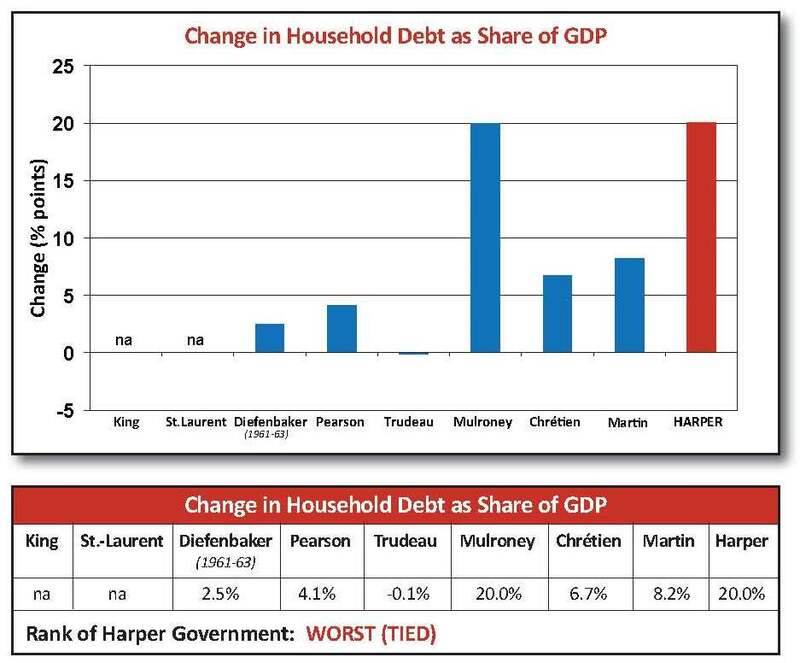 You can compare their performance above in light of the interest rates with which they (and Canadian citizens) had to grapple, when it comes to both household and federal debt. Graph created by andrewmacdonald.com, modified by me. Moreover, we shouldn’t forget that Canada’s success in managing that financial crisis reflected long-standing policies that had been in place for years, or even decades, before the Harper Conservatives came to power: protections such as public deposit insurance, public mortgage guarantees (and corresponding rules on mortgage quality), restrictions on foreign investment and takeovers in Canadian banking, and modestly stronger capital requirements for banks. Canada's recovery from the Great Recession was crippled by the Conservative majority government win in 2011. Between needless austerity programming, "trickle-down" policy, and an ill-advised "petro-state" policy (of which more later), the government, unconstrained by the need to please other parties in the House, weakened rather than strengthened the recovery process and the economic fundamentals  which may have kept Canada from sliding into a recession this year. Now, it may be that we are reaching the stage where diminishing returns on economic growth have reached a point where we can no longer count on sustained growth; this would not be the fault of the Conservatives (being instead a structural feature of physical and socio-economic limits on the process). What is the fault of the Conservative government, if this is the case, is its apparent inability to communicate this fact plainly, or to make policy to manage a smooth transition to a low- or zero-growth future. 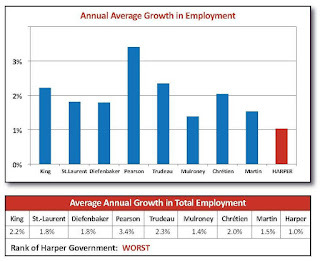 And frankly, I'm not confident that the "Harper Government" would be up to the job in such a scenario. A stock market collapse in China, alongside a wider economic slump there, with a follow-on downturn in commodity prices. Canada's real estate sector has experienced a bubble, and may be up for a correction (read: a crash), especially in light of the collapse in commodity prices. Canadian consumers are, in essence, tapped out, and may be unwilling or unable to shoulder the burden of recovery by taking on more household debt. I will here argue that the Conservative government ought to have seen at least some of this coming, and taken steps to prevent it from having an undue effect on the economy - if, that is, they were sincere about being a "steady hand on the tiller", and better stewards of Canada's economic fortunes than other parties. Courtesy of the 19th century, Canada had something of a reputation of being a "primary industry" country (that is to say, a country which depended in large part on extraction of natural, mineral, and fossil resources for its prosperity). And to some extent this is still true. In 2011, the resource industry accounted for 15% of Canada's nominal GDP (source), and by 2014 it accounted for 20% (source), a massive change in only three years. To a lesser extent, primary food production (agriculture - including animal husbandry - and fisheries) are also important, with primary agriculture accounting for 1.7% of Canada's GDP as of 2011 (source), and fisheries accounting for somewhere less than 0.5% (no hard source I could find, but aggregates of agriculture, forestry, and fishing were reported as 2-3% over the last decade or so). In short, even though Canada does services and retail (per Wikipedia, the former sector, writ large, accounts for 78% of Canada's GDP, and the retail subsector accounts for 12% of employment, making it the largest single employment sector in the country), natural resource extraction of one form or another is a big deal. So you can see from the below graph, of natural resource price indices (plotted from monthly data supplied by the Bank of Canada), that the last few years (but especially the last few months) have not been kind to Canada's primary industry sector. The word "volatile" springs to mind, at least as regards the energy sector. 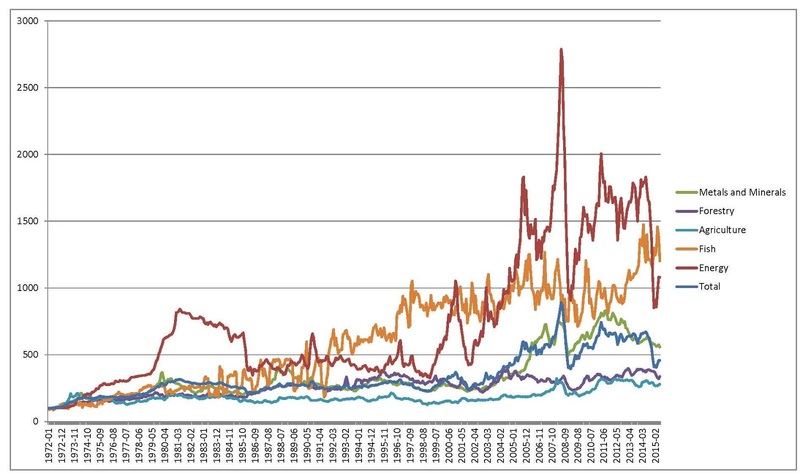 As you can see, the agriculture and forestry indices have been relatively stable since the index starts in 1972; fishing has been volatile but trending generally up (but it doesn't affect either the "total" index or the economy at large much, due to its small size relative to other sectors); metals and minerals were stable until about 2004, when they rose sharply, dropped during the Great Recession, and peaked in 2011 before declining steadily to the present. 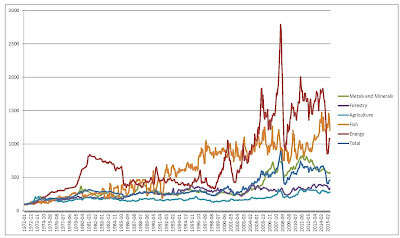 But the energy index, in the meantime, has been very volatile, with an inflection point in 2000. The energy price index collapsed during the Great Recession, rebounded rapidly, and collapsed again in 2014. The total index, reflecting the performance of all the price indices, strongly matches the energy index, particularly in the 21st century. And energy production, as the sources above note, possesses the largest single share of the economy of the various primary industries. In short, when energy takes a dive, it drags the overall economy along with it. 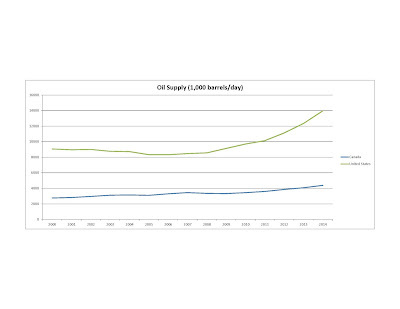 Now, if the Conservative government didn't make such a big deal of being a "good steward" of the economy, it might not be fair to pin the over-large economic share of primary industry (and especially of fossil fuels) on it and demand that it own the resulting difficulties with the fall in commodity prices. But "good steward" of the economy is how the Conservative Party has portrayed itself, in Opposition and government, for years, even if it has consistently refused to accept the responsibility for bad times and weak recoveries that come with taking ownership of the economy's performance. Commodity Curse: The problem with the 20% share of nominal GPD that primary industry possesses is that it's 20% of nominal GDP. Compare that to, say, the US (~2⅔% in 2012 ), Australia (9.6% in 2010-2011), both of which also have prodigious natural resource bases, suggest this number is unfortunately high. It's comparable to Norway, and to several resource-rich but less developed countries (Russia comes to mind, here). The Norwegian comparison is instructive, since Norway has, if anything, a larger economic share of primary industry (including fossil fuel extraction) than Canada. And it appears that the affect on Norway's economy is similar: over-dependence on primary industry is a problem when commodity prices are volatile. Now, the debate is how long and deep Canada’s downturn could be. And yet, with an election on the horizon, Ottawa seems in denial. Earlier this month, federal Finance Minister Joe Oliver told reporters the economy “was not in a recession,” while Prime Minister Stephen Harper later blamed any slowdown on overseas events beyond Canada’s control, declining to elaborate on just how Canada allowed itself to become so exposed in the first place. Yet, as recently as December 2013, the Bank of Canada was still touting rapid Chinese economic growth as a reason why oil prices would continue to rise and benefit the Canadian economy. But, so far at least, the country’s rust belt renaissance has sputtered. Recent numbers from Statistics Canada show that exports to the U.S. dropped by 0.3 per cent in May to $32 billion, while imports from the U.S. grew by 0.5 per cent to $30 billion, contributing to a $3.34-billion trade deficit for the month, and putting us on track to post a record trade deficit in the second quarter. The attention now being focused on the manufacturing sector is, in some respects, too little, too late. When the global price of oil was above US$100 a barrel, Ottawa was fixated on finding new ways to move tar-like oil sands bitumen from northern Alberta to international markets, pushing projects like TransCanada’s Keystone XL pipeline. All the while, Canadian manufacturers continued to suffer from low productivity and weak demand for their products—with one notable exception: those companies that focused on the oil and gas industry, or had retooled their operations to take advantage of growth in the sector. “Take a look at the province that created the most jobs in manufacturing since the end of the recession. It’s not Ontario or Quebec. It’s Alberta,” [Bank of America Merrill Lynch economist Emmanuella] Enenajor says. Global Warming and Oil Promotion: Of course, it doesn't help matters that the industry the Conservative government championed was that of fossil fuels. 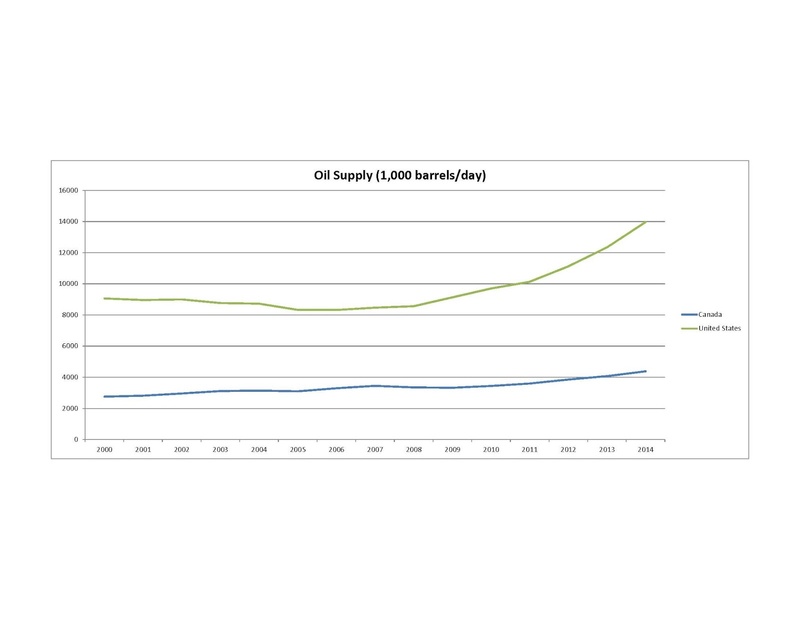 When Canada (and indeed the world) ought to be undergoing as rapid decarbonisation as possible, the government worked diligently to instead expand fossil fuel production. I shall have more to say on the Conservative record on climate at another time. It's not a secret that the Canadian housing market has been red hot, especially in Vancouver and Toronto. It's also not a secret that for some time this has been an area of concern, both nationally and internationally. The Maclean's article linked above interviews a number of economists and traders discussing the issue, and refers to a report issued by the Deustche Bank which indicated Canada's housing market was in a bubble. I haven't found a direct link to the report itself, but the Financial Post has an article discussing the report, including, helpfully, several graphics. 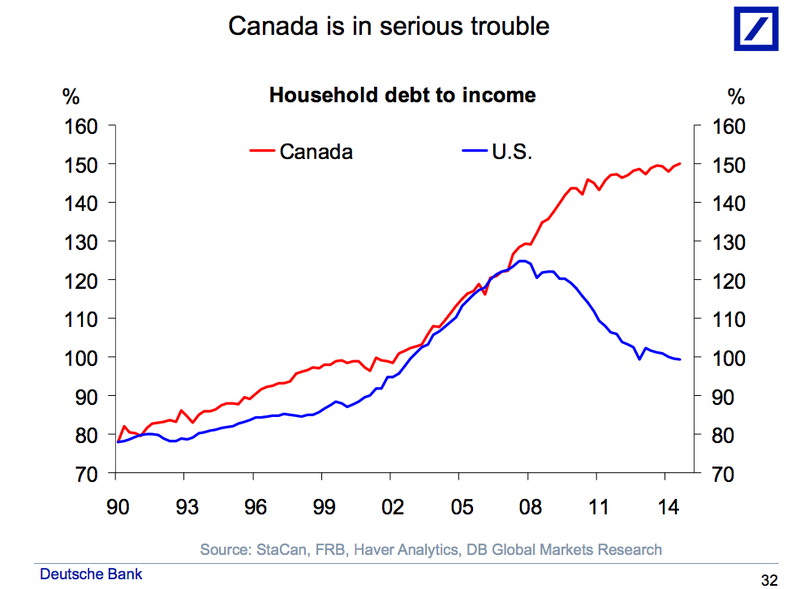 The Deustche Bank report also touches on another aspect of the Canadian household that is a troubling sign: household debt. 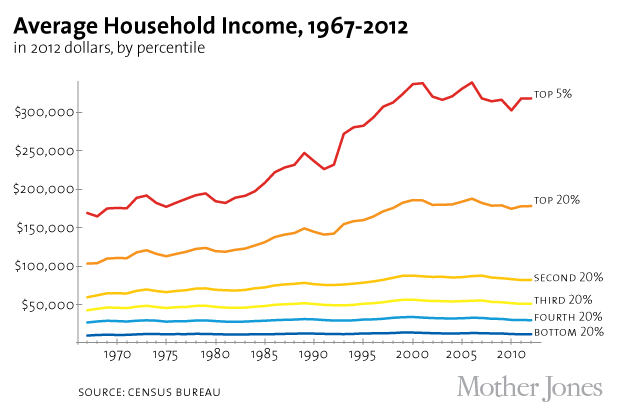 Since the Great Recession, US households have reduced their overall debt load. Canadian households? Not so much. At the same time, Canada’s unstoppable housing market, which almost single-handedly pulled the country through the 2009 recession, now looks more like a millstone hanging around our neck. During a June speech in Vancouver, Bank of Canada governor Mark Carney [predecessor to current governor Sephen Polotz] suggested the rush among Canadians to take advantage of rock-bottom interest rates to buy homes has not only ruined the balance sheets of many households, but has actually impeded growth by diverting resources from other parts of the economy. He also reiterated his warnings about soaring debt-to-income ratios and said the number of Canadian households vulnerable to an economic shock has reached a nine-year high. Now, there isn't much to say about a real estate bubble with respect to the Conservative government, as the policy remedy for bubbles rests with the Bank (the remedy, higher interest rates, is one the Bank has been loath to apply, arguing as recently as April that there was no bubble. That said, the Minister of Finance appoints the governor of the Bank of Canada. I am sure that current governor Stephen Polotz is himself quite competent, but it may be that his skills and predilections may not be an optimal match with the economic conditions in which Canada has found itself since his appointment. 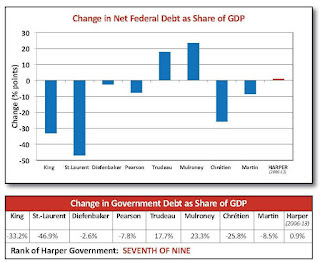 If Polotz's fiscal policy proves a failure, the responsibility falls in part on the government that appointed him: the late Jim Flaherty and Harper's government. 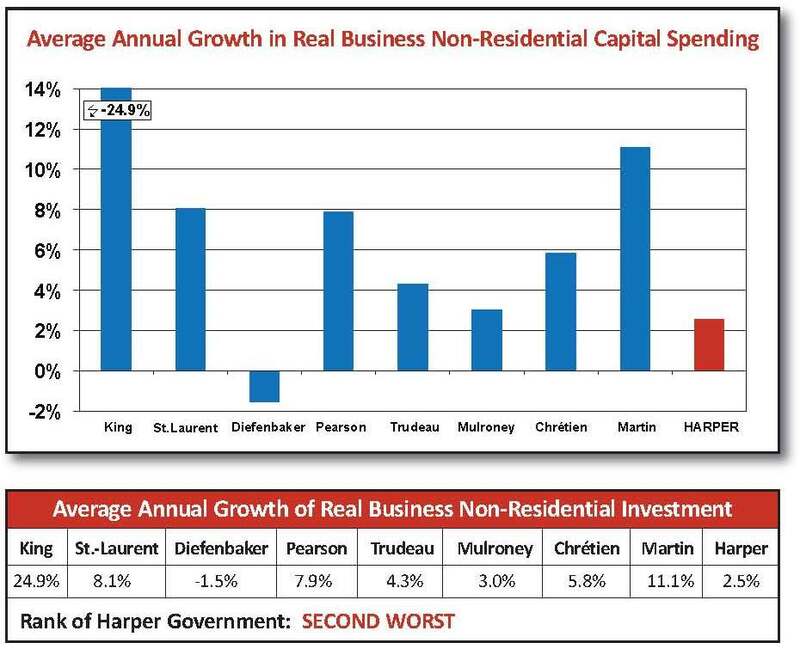 If anything, over the time of the Harper government incomes in all but the top quintile have declined slightly. In short, given static incomes, it's little wonder Canadians have turned to debt instruments to deal with rapidly-increasing costs of higher education and housing. Granting that the Conservative government appears to be opposed to such policies as a matter of ideology (and therefore, by its own lights such policies would be "wrong"), it seems to me that sitting around talking about "jobs and the economy" and "Economic Action Plans", and doing little that helps anyone save for the wealthy and corporate interests (unless you count the bait-and-switch that is the increase to the (taxable) UCCB), is pretty well negligent. The bottom line is that, like the decline in China's consumption of resources and in oil prices, the Conservative government had fair warning that house prices and household debt were getting out of hand - if anything, the problems facing Canadian households were far easier to see coming than the decline in oil prices. And yet, the Conservative government decided that a "steady hand on the tiller" was required for the economy, apparently ignoring that sometimes the appropriate course of action is to steer the "ship of state" away from the icebergs of speculative bubbles combined with escalating debt. What's more, these problems have been telegraphed since about 2011 at the latest - as such the government can't say it didn't see them coming. Thus, the state of the economy appears to be an example of Conservative misgovernment, an example all the more damning given that the Conservatives have consistently portrayed their party and government as the most competent of the major parties on the subject of the economy. It is a self-identification and reputation that increasingly appears to be undeserved. Housekeeping: Here, Have A Cookie! What Do You Do Instead Of Masturbating?